On January 5, we heard a lot of hot air from Governor Malloy on topics ranging from Spending, Taxing, Education, Crime and even the role of government. We all know that Governor Malloy's words doesn't always match his deeds. So just to clear up some confusion, we've put together a short list to cut through the rhetoric and get straight to the point on Governor Malloy's record and agenda in Hartford. "We have made more affordable housing available." "In the last 5 years we have added 80,000 new private sector jobs"
"We are attracting new businesses to our state, creating hundreds of jobs." "There must be shared sacrifice in this budget. We need a more fiscally sustainable state." "We've accomplished many big things over the last six years." "That's why we must tie our hands and the hands of future generations." "I'm going to cut funding to towns and education so I can attempt to pay for ridiculous pet projects." "Take it from the 24% of residents who approve of my leadership." "Our credit card is maxed out!" After 6 long years of Governor Malloy's mismanagement and doublespeak, don't you think it's time to stand up and say "ENOUGH"? Join Connecticut Republicans in our effort to STOP Governor Malloy and his liberal allies from hiking taxes yet again on Connecticut's hardworking families. 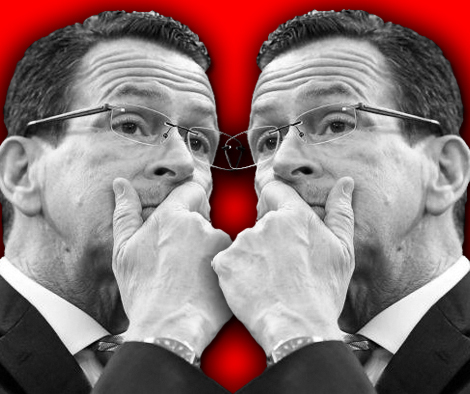 Call Governor Malloy at 860-566-4840 and tell Tax Man Dan you've had ENOUGH of his taxing, spending and doublespeak!